So, forget about splashes of paint on a canvas, forget about all that conceptual, intellectual “abstract art”. Step into the world of folk art and you step into a world that is uninhibited and basic. Folk art is art drawn outside mainstream lines, it comes straight from the heart with an earthiness and believability that’s hard to ignore. Folk art makes me smile. When you see folk art, you’re seeing one of a kind art; and that’s a rarity in today’s mass-produced world. Using found objects, cast off car parts, sticks and stones and basically whatever is at hand, folk art speaks loudly to us. The artists who create it may live in a huge metropolis, or they may live beyond the sidewalks. They don’t fit any mold on purpose; they’re too busy doing their own thing. Folk artists let their freak flag fly, and bravely so. 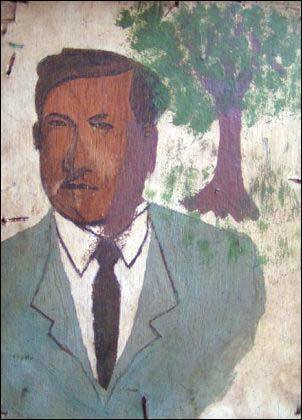 Elito Circa’s first Indigenouism painting. Mixed media with soy sauce, enamel paint, water, and tinting color on plywood. Filipino folk artist Elito Circa definitely thinks outside the box. His work is edgy and on the outer rim of the folk-art world. Using indigenous human hair and blood, his paintings symbolize life, love, and sacrifice. As a child, whenever he cut or injured himself he would save his blood to use in his paintings. ; he believed every drop was too precious to waste. Because of his use of indigenous materials, Elito Circa is practicing Indigenouism; a form of art that promotes environmental protection by using indigenous materials. Circa also uses vegetables, fruits, charcoal and soy sauce in his work. ; sometimes he even uses paint. His goal is to personify the cultural myths he grew up with in the rural village in the Central Luzon region of the Philippines. One of those myths is the Legend of Minggan, a giant from the Sierra Madre mountain range who was in love with the mountain spirit goddess Mariang Sinukuan. As a child, Elito was told by his father and grandfather that the giant’s footprints could still be found in some parts of the mountains where he had walked carrying gifts to the spirit goddess Mariang. Elito never had formal art training but started drawing with charcoal from the stove in his family’s kitchen; he drew on the walls of their house at first. When he drew on paper he gave his drawings to family, friends and his teachers. 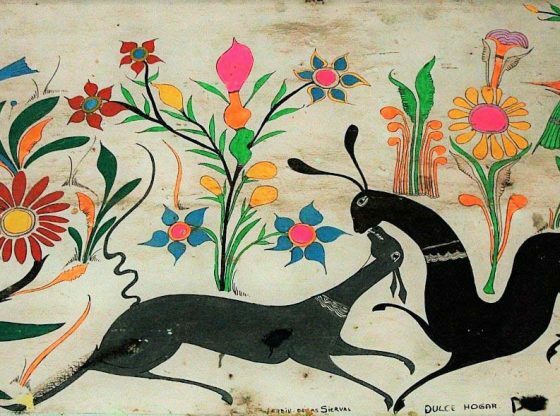 Circa’s use of natural raw and indigenous materials in his art has brought new meaning and inspiration to other artists in the field of folk art. Today he is internationally recognized for his unique folk-art creations and is known as the first hair and blood painter of his generation. I can’t think of a better example of someone who refused to let her age stand in the way than the folk artist known as Grandma Moses (September 7,1860-December 13,1961). She didn’t start painting in earnest until she was 78 years old. Growing up one of nine children on the family farm in Greenwich, NY, school was not a regular event for Anna Mary Robertson Moses; it was attended mostly in the summer months because the bitterly cold winters prevented the long trek to school. Her days were filled with the duties of farm life that would later be depicted in her paintings. In 1887 Anna Mary married Thomas S. Moses and they moved to a farm in the Shenandoah Valley of Virginia. Theirs was a hardscrabble but beautifully simple life. Through the years, Anna Mary gave birth to ten children, five of which died at birth. Sometime later, the family moved again to a farm in Eagle Bridge, NY and it’s thought that this is when Moses painted her first picture. I like to think her artistic tendencies had been percolating all those years on the farm until one day she could hold inspiration back no longer. Walking down the street one day in Hoosick Falls, NY in 1938 an engineer named Louis Caldor happened to see some of Grandma Moses’ paintings in the window of a local drug store. He stopped to take a closer look and was so struck by the profound simplicity and vibrancy of her work that he bought all the paintings and decided he would introduce them to the world. It didn’t take long for the world to sit up and take notice. Shortly after Mr. Caldor’s discovery, her paintings were shown at an exhibit highlighting unknown artists in the Museum of Modern Art in New York City. It was quite a jump for Anna Mary to go from farm wife to big city artist. She then went on to have her own one-woman art show at the MOMA. After that her paintings were displayed at the then popular Gimbels Department store in New York City; once known as the largest department store chain in the country. She simply painted pictures that depicted life on the farm; events like wash day, the seasons of the year, apple-butter making and quilting were some of her subjects she brought to life with lots of color and detail. Her style has been called primitive and even naïve because perspective and proportion weren’t important to her; her goal was to show us how farm life was lived in her day. She was completely self-taught, proving that art lessons are not necessary for greatness to show itself. Known as one of the most famous American folk artists, Grandma Moses’s paintings have been shown and sold all around the world. In 2006 her painting called The Sugaring sold for $1.2 million. If she only knew! Today, you’ll see her work in galleries and on merchandise like greeting cards and coffee cups. And if you visit the MOMA, you’ll likely see her work there too. Howard Finster (December 2, 1916 – October 22, 2001) was an American folk artist and Baptist minister from Georgia. He claimed to be inspired by God to spread the gospel, not only through his sermons, but through his art. One night he had a vision; he saw his deceased sister Abby Rose coming to him out of the clouds. She spoke to him, saying “Howard, you’re gonna be a man of visions,” and so his spiritual journey began. When he was 13 he was “born again”, he began preaching at the age of 16, eventually becoming a full-time minister. It was shortly after that he felt led to start dabbling in art. Finster thought of himself as an artist on a mission. His purpose in art, as it was in preaching, was to bring the Christian gospel to the world. He used any tools or objects he had at hand to create his folk-art pieces, sometimes actually using only his hands to paint with. He made art from cast-off odds and ends like hubcaps and bicycle parts. He also wrote Bible verses on many of his creations, and it’s been said by some that his works can be likened to short stories. Finster’s art was varied; he painted pictures of everything from Jesus to Marilyn Monroe, and he painted with insatiable energy. Word got around about Finster and his inspired works of art and he was commissioned to do album covers for R.E.M. and Talking Heads. Finster’s masterpiece and the project he devoted many years of his life to is a place he named Paradise Gardens; a folk-art sculpture garden in Summerville, Georgia. To this day, Paradise Gardens is open to the public and known as one of the most popular tourist destinations in Georgia. 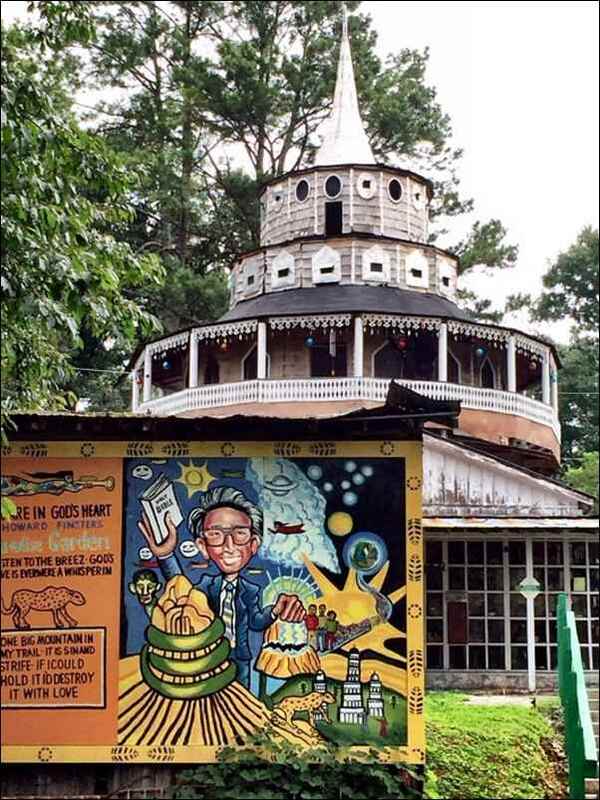 Howard Finster’s Paradise Garden in Summerville, Georgia. People who visit say that they felt the effect of Howard Finster’s spirit and dedication there as they wander among the 46,000 pieces of art that he created. They say the energy they feel is palpable and there is so much to see that it can’t all be seen in one day. Paradise Garden is a whimsical, magical place that inspires those who visit in ways they never expected. Many of the sculptures and signs are covered with Bible verses and every piece in the garden is created by hand. He also painted what he called sacred art on pieces of rough wood; the paintings echo the Bible and popular culture. This amazing folk artist dedicated his life to filling Paradise Gardens with his inspired folk art and today it’s an exciting and energetic place that leaves people feeling inspired. Salvation Mountain is Leonard’s tribute to God and his gift to the world. His entire life philosophy, he said, could be summed up in one sentence: “Love Jesus and keep it simple.” He lived by that principle every day of his life. The folks living at Slab City loved Salvation Mountain and believed in Leonards’ mission so much that they donated much of the paint and supplies he needed to complete it. The mountain was almost 30 years in the making, took half a million gallons of paint and was made mostly of dirt, adobe and hay bales; it now stands at least 50 feet high. The first time he built it, it collapsed. Not one to discourage easily, he immediately began construction on the second Salvation Mountain, the one that still stands today. Leonard Knight was an inspired folk artist that sacrificed it all for his art; what he created has a charisma all its own. The field of folk art encompasses so many creations; it’s a vast field that can and does include just about anything. From statues to paintings to carvings to collages to basketry to street art. Almost any type of creation can fit into the field of folk art. It can be highly decorative, bright and bold or subtle and intricate. It’s strong yet simple, and, many times, very unique. Folk artists are mostly self-taught individuals who simply decided to take up something in their world and turn it into art as they perceived it. It’s all about the freedom of personal expression, a desire that lives inside all of us. Street art is folk art and includes yarn bombing and guerrilla art. Created in public places, street folk art is sometimes a welcome addition to a town or city, sometimes not. If you’ve seen graffiti, you’ve seen folk art. Other names for street art include urban art, guerrilla art, and yarn bombing. 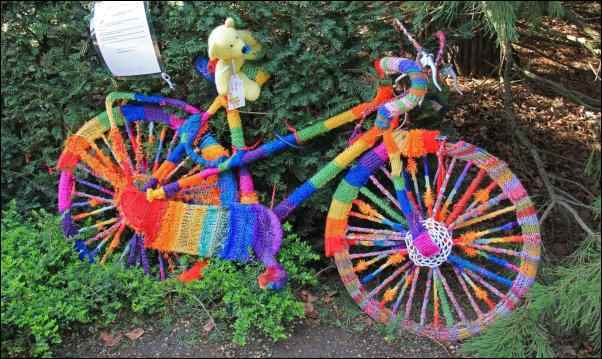 Yarn bombing has become popular as a form of street folk art that uses yarn to cover anything from tree branches in local parks to street light poles in New York City. Guerrilla art is folk art that’s not for the fainthearted. Guerrilla artists express their opinions by leaving their art around the city anonymously and in unauthorized places. It’s how they let the world know how they feel about an issue in a big way. Many guerrilla artists are attempting to make a political statement, but others just do it for the fun of it. It’s their way of reaching the largest audience they possibly can in a most original way. If you’re one of the folks, you can do folk art. Any one of us can pick up a brush or a carving tool or a found object and make it into something worthy of this unusual form of art. All cultures have their own style of folk art. Some folk artists have become well known, some have made lots of money, some have lived and died and never been known at all. Most are just quietly practicing their art wherever they live, be it deep in the heart of Texas or high in the mountains of Montana or amidst the cornfields of Kansas. It doesn’t matter if anyone ever sees what they produce, because it’s not about showing the world, it’s not about getting attention; it’s about unrestrained self-expression and what comes from the heart and soul. They may or may not have gone to art school, they may or may not have what the world calls “talent’” but that doesn’t stop them. They’re just letting their freak flags fly. Catherine Thank you so much for this wonderful and informative article, I enjoyed reading it very much. 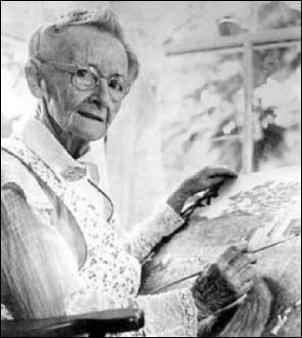 I got tears in my eyes reading about Grandma Moses, what an inspiration she is to those of us getting up there in years, that it is never too late to start something you are interested in.